These are decks mtwo different direction- deck designade from boards running in different directions. You can use this type of deck for covering up different activity areas in your home, for instance, the hearth, the dining area or the breakfast bar of your house. You can place this deck type amid existing trees for allowing it to get blended into the surrounding landscape. The most common wood type used for making these decks is rosewood. If you want your home to have a vintage look, there cannot be a more appropriate decking option for you than vintage deck. 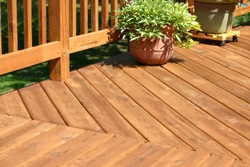 The boards of this type of deck are usually gray in color and have a weathered appearance. However, although they look worn they are not actually damaged; they are as sturdy as other newly installed deck types, but have a different finish for looking traditional. 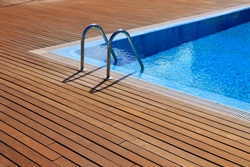 If you want to make the swimming pool in your yard look even more attractive, you must install a specially designed pool deck around it. These decks usually possess identical boards and the mostly boasts the natural color of wood. However, if you want, we can draft fresh pool deck designs for you by adding more elements. Do you want to have an area in your garden where you can sit and chat with your friends and family members? Then, you should get a garden deck platform installed as soon as possible. We offer extremely sturdy deck platforms that other than making your garden area more useful will also enhance its overall appearance. Usually, these decks are made from evenly sized boards boasting the natural color of teak wood. 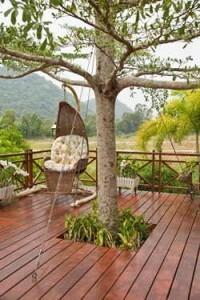 You have a big tree in your lawn or garden and wondering how to utilize its presence; is this the situation you are in? 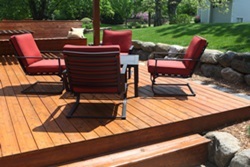 If yes, then call us for designing a deck for you that can be installed around the tree. These decks possess evenly sized boards, and either comes with a round or square hole in the middle. We offer decks of all possible kinds. The deck designing experts representing our company are not only capable of making decks incorporating their own design ideas, but can also make decks garden deck platformfollowing the suggestions of our clients. To get a deck that can meet your needs perfectly, call us and let us know what your needs and preferences are. You can tell us about the kind of wood you want the deck to be made of, the design you prefer the most, the desired dimensions of the deck and the color you want it to possess. 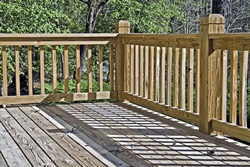 Our craftsmen will make a deck exactly according to your specifications.